Notes: Caution 1: I've tried to avoid revealing too many critical details about this show, but some things must be mentioned as part of my assessment, which might be considered spoilers. Caution 2: Please read the full review of this show, and don't just go by the star rating. There are several criteria one might apply to judging this show, which are better appreciated by reading the full review. 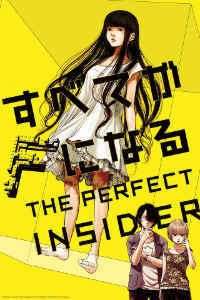 Engineering professor Sohei Saikawa, along with Moe Nishinosono (the daughter of Saikawa's deceased mentor), visit the island laboratory where brilliant (but homicidal) computer scientist Dr. Shiki Magata is kept in permanent confinement. During a power outage, a dismembered corpse is discovered that is identified as Dr. Magata's. Since no one has been in or out of Dr. Magata's lab suite in 15 years (as documented by video records), who did it? And how did the killer escape? In Japan on Valentine's Day one can get "obligatory chocolates". It's no insult to get them; they're customarily given to acknowledge appreciation for someone's friendship and/or support; "obligatory" just means that the recipient is "not the One". The four-star rating I'm giving this show is like obligatory chocolates. I'm acknowledging the show's virtues, but it wasn't "the One" for me, I suppose. And I also loved Moe. Yes, that's her name, and it suits her. She's 19, and has been in love with Saikawa ever since, when she was a child (and he her father's student), he figured out one of her card tricks. She's also rich (I guess her dad had some good patents) and has a gift for lightning calculation. She 's passionate and has a strong sense of right and wrong, traits which reminded me a lot of another anime young lady I greatly liked, Mai in Ghost Hunt. One of the strangest moments I've ever encountered in anime happens between Saikawa and Miki Magata, Shiki's sister, when they have a conversation in grammatically correct, but incredibly stilted, English. The Japanese VA's could READ the English, but apparently received little coaching in how to do emotional inflection in it; though since Saikawa usually doesn't express much emotion in Japanese either, it somehow seems less jarring on his part. Speaking of Miki Magata, by the way, for a show obsessed with getting certain technical details right- I'll get there too, don't worry- the logistics of Miki's comings-and-goings seemed to make little sense when I considered them in detail, but maybe it's just me. Oh, I mentioned technical details just now, didn't I? Well, you'll find out just how the killer evaded the cameras that perpetually watched the only door into Shiki Magata's suite, and you'll find out what "everything becomes F" means. (It turns up in some messages that may have been written by the killer.) Both of the resolutions to these mysteries may be of great interest to tech fans. And speaking of tech fans (look, I know this review is more free-associational than what I normally do; maybe it's a "virus" infection from the show's own meandering structure), one character turns out to be a delightful exception to the "cyber nerd" stereotype, specifically Shimada, who turns out to be more sensual (as in "yuri"), more appearance-conscious, and in general much more of an all-around "party girl" than one would associate with that stereotype. And finally, there's the issue of the murderer him/herself, who Saikawa ends up admiring. Yes, admiring. For their "freedom", but I'm not even sure Saikawa himself is clear about what he means here. In an exchange with Saikawa, the murderer cites bits and pieces of various philosophies, and I tried to identify his/her philosophical preference- is it Nihilism? Deconstructionism? The killer seems to not really be attached to any particular philosophy, save one: at one point, the killer goes on about life being unnatural, and death being the ideal, so Saikawa asks a logical, pointed question- if the killer really feels this way, why doesn't he/she commit suicide? And the killer begs off with what I thought was a rather weak excuse, and then I knew what the killer's real favorite philosophy was- Solipsism. The idea that one IS the center of existence. The philosophical system requiring the least thought (and justification) of all. And the one that excuses all behavior. And then I finally understood it all (well, except for those few nagging extraneous details.) It's not the conclusion drawn by anyone in the show; it's just my own. But it makes sense.